A key starting point in the development of any marketing strategy is the identification and selection of target markets. As a profession, marketing is becoming far more data driven and the reliance upon supporting statistics is increasing. In the past, it was probably acceptable to generally define the firm’s target market. However, in today’s data world, expectations are that target markets and market segments have been statistically determined based on available information.That is where cluster analysis comes into play, as it is able to assist in transforming large amounts of data into organized and grouped information that form the basis of market segments. It will classify each consumer into a particular segment/group – and once classified, other related information and data can be organized to construct a segment profile description that can be used to assist in developing an effective marketing strategy. While cluster analysis can be quite beneficial in the market segmentation process, it should be used with care. This is because cluster analysis just is a statistical process without any logical understanding of the data – it just groups the data that it is given. 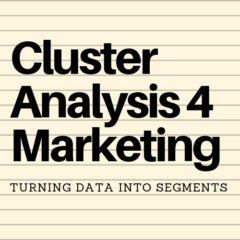 Therefore, a key part of the successful outcome of cluster analysis relies upon the marketing analyst determining the suitable marketing variables to include in the analysis. The marketing analyst will also need an understanding of what makes a viable and effective market segment. Without these particular skills and consideration, it is possible that groups may be formed from a data perspective only – and the resultant “market segments” may not be very usable for the firm’s marketing strategy.